The design is extremely hard to make and countless threads of different colors have been used to produce this amazing piece. This is totally handcrafted in hand knotted technique. This traditional carpet is suitable for a space with light and subtle interiors. 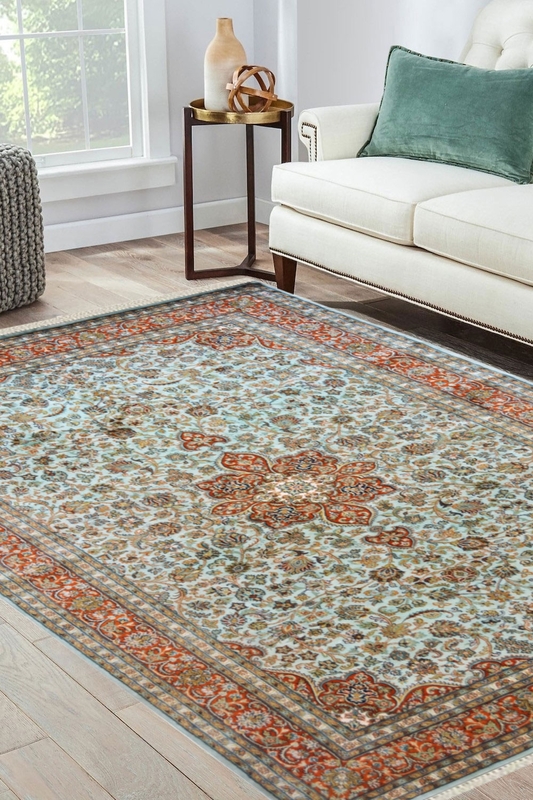 The center of this carpet contains a medallion in rust color which gives a very jewel look to this carpet. - This carpet has a great look with a very vibrant color. This is silk on silk rug. Warp and weft both are in silk. - It has a very defined pattern. This carpet is woven in the highest quality of silk (Pure silk). - It takes approximately 11 months to weave this gorgeous. - Number of Knots in this rug are 576 knots per square inch. - This floral medallion design looks like a typical net of the flower. which is scattered on a greenish ground. - So let's decorate your home with this beautiful carpet and enhance the overall interiors of the space. - The primary color is Pista color on a greenish background.